When we began making black walnut syrup last winter, we wished for a go-to guide to help us with the process. 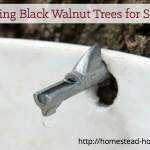 We knew from talking with local friends that black walnut sap was drinkable and very tasty; surely if we boiled it down we’d come up with an edible product! 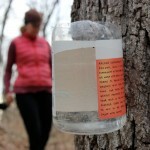 After a season’s worth of tapping and boiling down sap, we discovered that black walnut syrup is DELICIOUS. 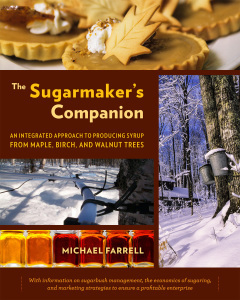 And, we discovered a book that I wish we had when we first began – The Sugarmaker’s Companion: An Integrated Approach to Producing Syrup from Maple, Birch, and Walnut Trees, by Michael Farrell. Chelsea Green, one of my favorite publishers, sent me a copy to review, and I began reading from cover to cover. What makes this book such a useful resource is that its author, Michael Farrell, is the director of a maple syrup research and extension field station in New York. He has spent years tapping maples, birch, and walnut trees, and combines this hands-on experience with an academic background in economics and forestry to give syrup producers information about such topics as sugarbush management, sugaring economics, and marketing strategies, along with practicalities such as designing a sugarhouse and deciding if sugaring is for you. Now, I should say that this might not be the first choice book for someone brand new to the idea of tapping trees and producing syrup. 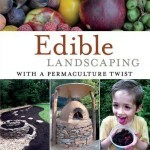 But if you’re looking to perhaps create a homestead economy around syrup, wanting information on managing your sugarbush, or looking for the latest research on how to most effectively tap trees, I’d order a copy of this book today! Because I’m a visual learner, I really appreciated that the book is full of high-quality photographs of sugaring equipment, techniques, and products, as well as clear graphs and charts. Even if you’ve never tapped trees before, the photos help make the process clear and easy to understand. I found two chapters of The Sugarmaker’s Companion to be particularly unique and informative: one detailing the sap-producing trees of North America (not just maple! ), the other describing sugaring in a changing climate. I also loved that there was an entire chapter devoted to collecting and drinking sap (more information on that in an upcoming blog post!). Bottom line – this was a VERY interesting read, and I really enjoyed expanding my knowledge of sugaring. Because the author tackles issues that are near and dear to many homesteader’s hearts like creating a diverse homestead income, calculating land-based economies, and managing your forest for maximum production, I highly recommend that homesteaders read The Sugarmaker’s Companion. 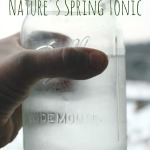 If you want to start sugaring or to expand your current syrup-making efforts, I would suggest purchasing a copy of your own, because it WILL become a frequently referenced source of information and inspiration. Thank you to Michael Farrell and the awesome folks at Chelsea Green for providing me with a review copy. You can purchase your own copy through Chelsea Green! Unfortunately I don’t know much about homesteading in Alaska, but it does sound like it would be a great place for someone with your interests! 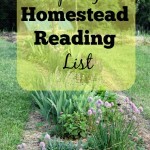 Maybe google “Homestead alaska” and find a few blogs to follow to get a sense of what it might be like to live there. Thank you so much for such a sweet comment. I really appreciate that you took the time to write this. Where in MO are you looking? we’re in NE Missouri. I’ll be curious to know where you land!